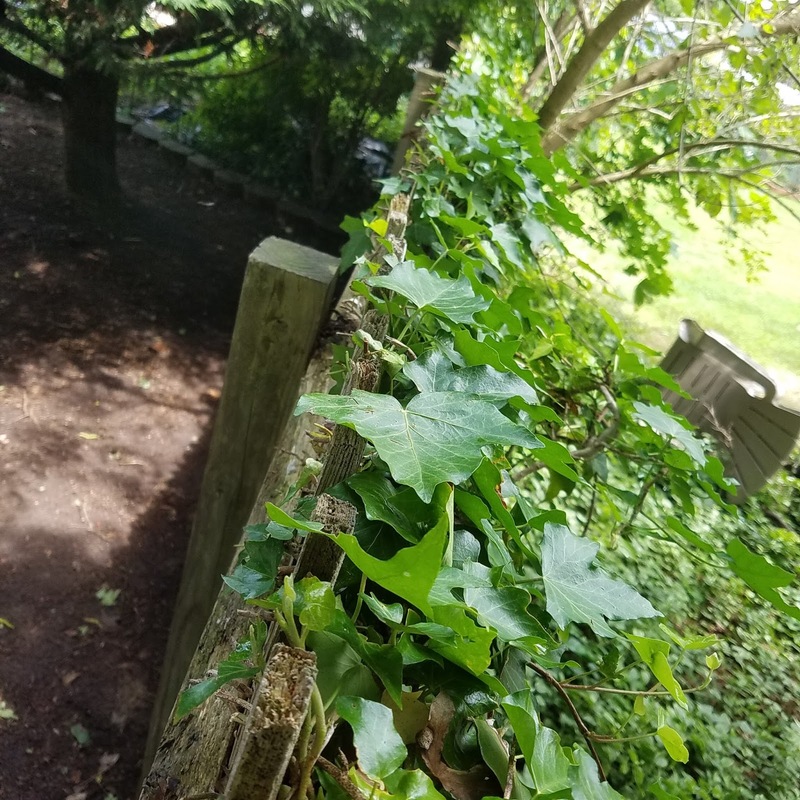 Garden Endeavors and other stuff: Ivy Vent ! It was sooo over due ! Many years ago my husband removed ALL the ivy from our yard BUT we couldn't keep up with the maintenance and our neighbors ivy that kept growing under and over our fence. 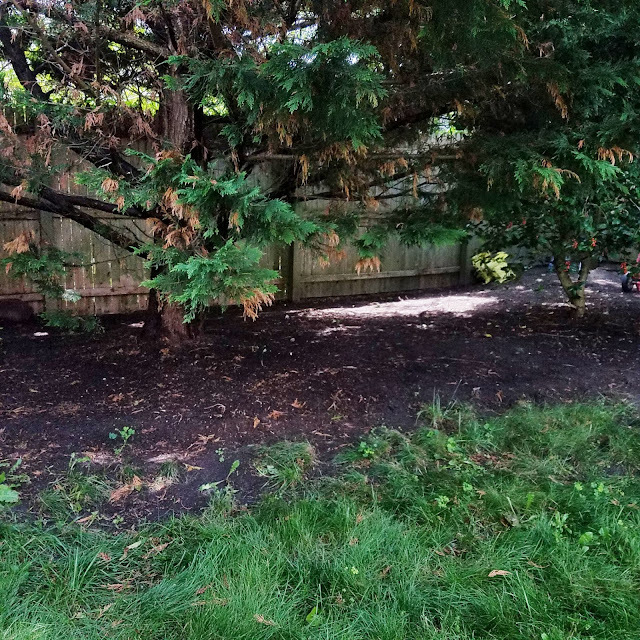 I was getting nutty looking at all of it on the fence and ground so husband finally hired people to dig it out. Now this is only my half of backyard and the driveway. 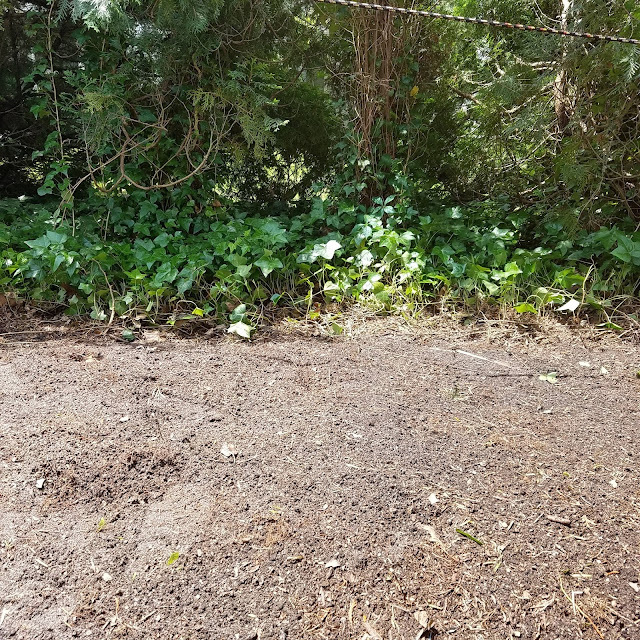 Where you see dirt now, it was the dreaded IVY. 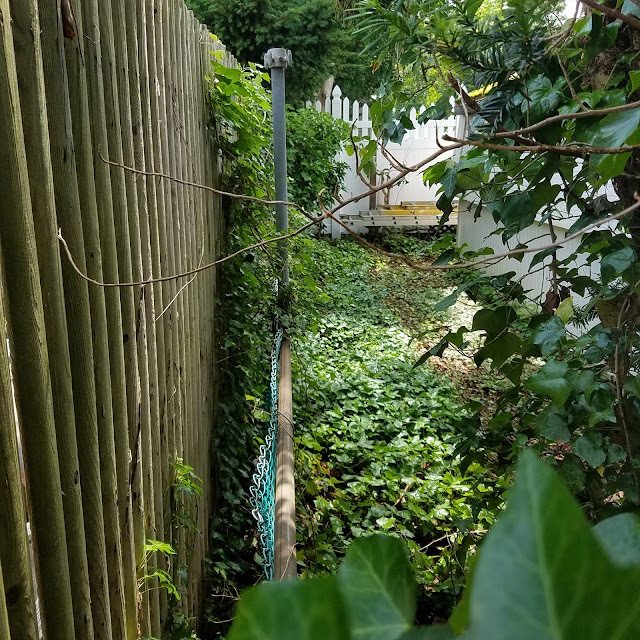 Now what to do about this ivy that has attached itself to our stockade fence on the neighbors side ? They LIKE growing ivy in their yard ! As you can see unfortunately over the years it has been destroying the fence. Had to laugh as we just hired someone on Monday to remove our ivy along a fence line. It is on the neighbor's side also but they are going to dig it out as well. Now, if only they would dig out the Vinca. We have vinca also but that's because I planted it all over, not knowing how annoying it would become. 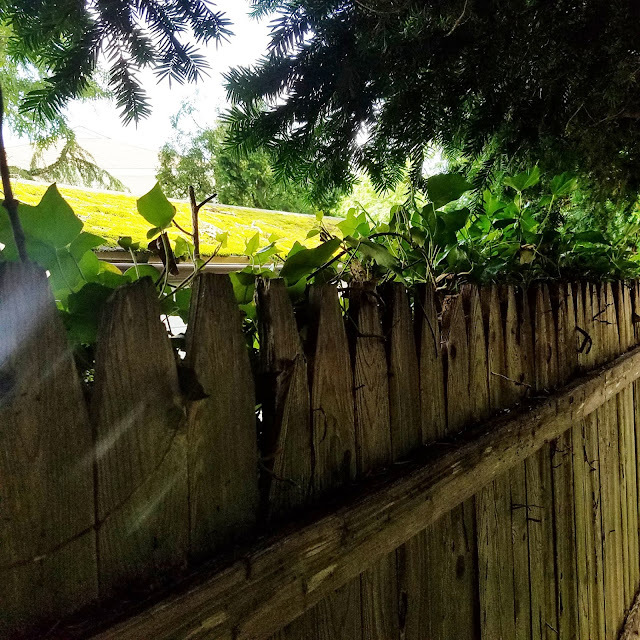 I wish our neighbors would remove their ivy (one neighbor does mow it down up to the fence) so like it or not I'll have to spray weed killer between the fences to keep it under control. What a difference! Your husband is a keeper for hiring someone to dig this all out. Hey Pats girl ! You should crack open a bottle of bubbly (well .. for a glass or two for good measure ? LOL) .. I know the ivy must be sooooooo annoying and when it is a "kept" plant by neighbors ? how can they not know it will be creeping over to your side as well yet again ? .. I do keep a tiny patch of the Englemann ivy because the colour was so beautiful in the Fall .. but it is a struggle to keep it under control .. just like my previous Staghorn Sumac tree .. but at the time .. I was loving it .. BIG sigh ! .. we go through different stages in our lives with our garden plants .. but as we get older we have to pare it down to manageable more than likable ? haha .. it is looking good for you now though. Good for you - and your husband! I hate ivy. 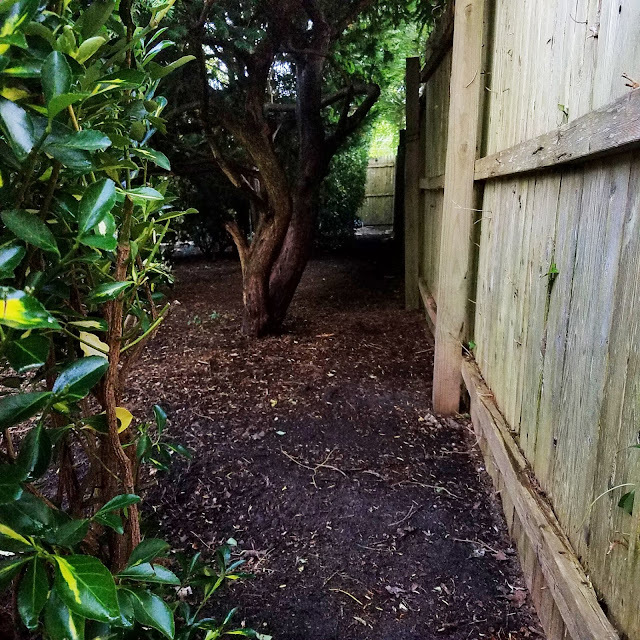 Unfortunately, it (along with equally troublesome honeysuckle) covers my steep back slope. I'll need sherpas to help me remove it! You have my sympathy! Ivy is the #1 most hated aggressive weed in my yard. 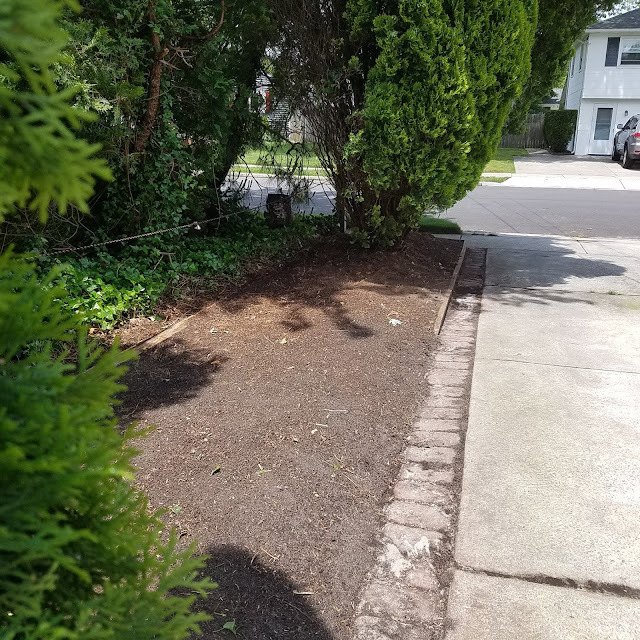 The lady that built our house loved ivy and planted a few sprigs here and there over 60 years ago. Now it has conquered the neighboring woods, and we work diligently to keep it out of the garden spaces. Short of agent orange, I think there is no hope of getting rid of it. One day in the far (hopefully) future, when we are gone and our home has become derelict, no doubt it will meet the kudzu atop the house and wage war for supremacy. Grrrr, how aggravating. They are probably liable for any cleanup work done. Around here, if people plant running bamboo, they can be charged for keeping it under control.